Days 92 and 93. 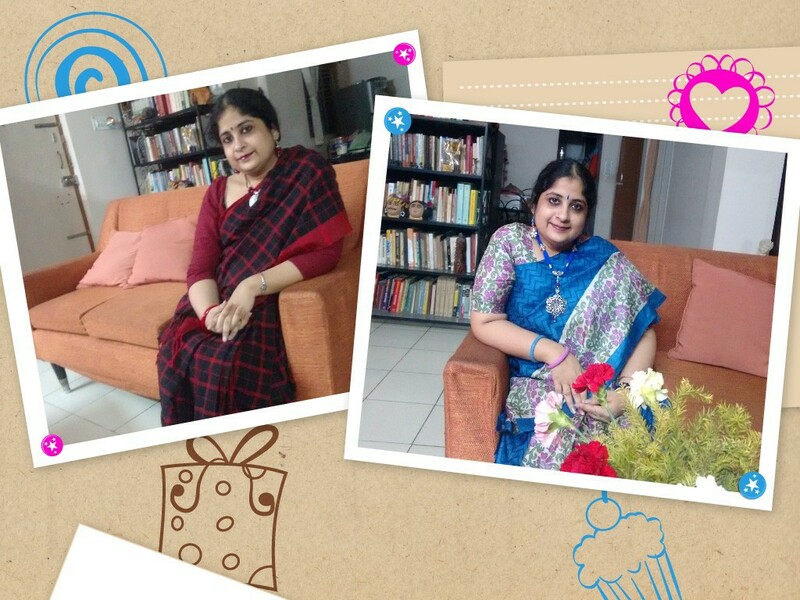 Two saris, two days and a very special birthday. Birthdays are always special and rich with memories. Be it reaching for the confetti from my father’s lap on my 3rd birthday, where the cake had Snow White and Seven Dwarves. Or the one a few years later, when my Boromamu was visiting and gifted me a box of chocolates, each shaped like a flower. That birthday was also perhaps the first that I had a friend come over, she was my namesake too. Birthdays after that were more often than not studded with friends. My first birthday in Hyderabad when my first friend from my new school, Divya, came over. I still have the photograph of the two of us sitting on a sofa, grinning ear to ear. She in a pink frock and me in a blue and white one. And the one when a big gang of my friends from school was invited and also those from our apartment. A few years later, back in Calcutta, it was time for a quiet birthday, perhaps my quietest ever. But I still got a new dress… a sea-green kurta from Gurjari…and also a cake from Kookie Jar that my uncle brought on the way home from my office. The evening had begun on a dark note, in keeping with the mood, with a spell of loadshedding. But the cake brought light that was brighter than the flicker of the candles I blew out. But a cloud of a different kind cast its shadow on my birthdays in the following few years – exams! But there were of course the belated birthday celebrations…small get-togethers with a few close friends over a meal cooked by Ma. Some of those friends I am still in touch with, some have drifted away in more ways than one. The big one came on my 18th. I had just joined college and Ma organised a grand do. Friends from school and college, family, cake, good food, laughter and me wearing a sunflower yellow sari and a sunny smile. The scent of the bunch of 17 red roses (the shop had one less!) that my new friends from college brought over still lingers. And so does the taste of the cheesecake and kebabs made by my Mami. The rest of my birthdays in college meant a treat to my friends at a roll shop and coming home with my bag full of cards and good wishes. My 21st birthday was also my first away from home but my Matu made sure I didn’t miss it too much. So did my hostel mates who sneaked into my room with a cake and gifts – a stone trinket box that still sits on my bedside table and tiny fish earrings that I still wear – at the stroke of midnight. The exam curse returned on my birthday a few years later, when I had a test to write for a job I eventually bagged at an organisation where I spent 11 long years. Coming home from the test, I had my (then) husband-to-be and few friends waiting for me. With marriage I found a birthday buddy in my mother-in-law (yes, we share birthdays). Birthdays have since been all about a family lunch or dinner at home, and sometimes both when I have been lucky to have the day off from work. It’s also about baking a cake for the other birthday girl and tasting the sweet payesh made by her. Or making sure the day’s menu has her favourites as well as mine. My second quiet birthday came around the first time my aunt couldn’t wish me on my birthday. Instead, that morning I received a text message from my cousin wishing me on her behalf as well as his. That message brought tears to my eyes, tears I had a tough time fighting when I went to see her in hospital that evening on my way to work. I wore a black salwar kameez that day, one that she had gifted me on my previous birthday. Little did I know then that in a couple of years, she would never again wish me. But her wishes remain. And so birthdays continue, with their share of gifts wrapped in love, smiles, happiness and warmth like the glow of candles. So was this birthday, spent entirely at home, wrapped in the love of my family members, showered with thoughtful gifts of every kind and, not one or two, but three cakes, flooded with wishes from friends and relatives far and near (some expected and some unexpected) and pampered with the cooking of my two mothers and a delicious dinner ordered by Achintya. Each gift, each wish, each call message, each moment was special in its own way. But the one moment that brought a sting to my eyes was my lunch platter served up lovingly by my birthday partner, complete with five types of bhaja. I had casually mentioned a few days ago that my grandmother always made sure that we cousins ate paanch-rokom bhaja on our birthdays. She would sit there watching us eat in the warm glow of the prodeep. Today, there was no need for the lamp, I was basking in the warmth of a loving gesture and memories of a birthday long ago when I sat princess-like in front of a thala surrounded by bowls of my favourite food as my grandmother, Baba and Ma took turns to feed me a spoon of payesh. The first sari is a cotton I picked up from Fab India last Puja. I had gone there to buy some gifts and had no plans of shopping for myself. I was heading for the cash counter to get my purchases billed when this sari, lying with a couple of others, in one corner caught my eye. I couldn’t resist taking a closer look but didn’t bother taking a peek at the price tag because I knew it would be expensive. That’s when a shopping assistant saw me and stepped forward. He insisted that I pick it up with the usual niceties and when I pointed out it was bound to be too expensive, he nodded his head and said “discount achhe”. I was still unsure I had heard him right when he looked at the price tag and announced with a smile ” Rs 500″. I grabbed the sari before either of us could change our mind. The second sari is a blue printed tussar that my mother gave me on my anniversary this year. I wore it for the first time today. Power dressing: A tailored suit? Nay. A saree!